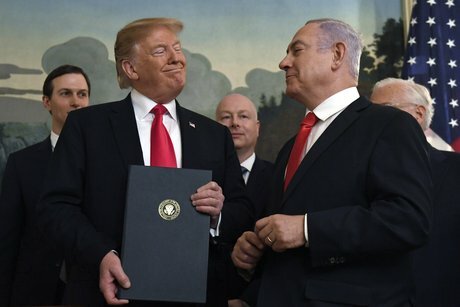 "The world has come to understand that Netanyahu is essentially the political twin of Donald Trump," said Jeremy Ben-Ami, president of the liberal pro-Israel group J Street. "Unlike his previous elections, there is a much deeper antagonism toward Netanyahu because of that close affiliation between him and Trump and the Republican Party." "It's troubling," said Halie Soifer, executive director of the Jewish Democratic Council of America. "The U.S.-Israel relationship should not be about any two leaders or any two parties. The American Jewish community wants the relationship to remain on a bipartisan basis." Though it leans Democratic overall, the American Jewish community — numbering 5.5 million to 6 million — is not monolithic. Most older Jews remain supportive of Israel's current Middle East policies, as does the roughly 10% of the Jewish population that is Orthodox. Jewish billionaire casino mogul Sheldon Adelson has been a staunch financial supporter of Trump and the GOP. Divisions among U.S. Jews have been exacerbated by recent allegations of anti-Semitism directed at the Democrats' two Muslim American congresswomen — Ilhan Omar and Rashida Tlaib. Seizing on the controversy, Trump tweeted his support for a purported "Jexodus" movement that would encourage Jews to leave the Democratic Party. "Republicans are waiting with open arms," Trump tweeted on March 15. Morton Klein, president of the conservative Zionist Organization of America, predicts such an exodus will take place because of the Democrats' decision to avoid explicit condemnation of the congresswomen. "I've yet to meet an actual Obama/Clinton voter who's said publicly they're switching to vote for Donald Trump," he said. "This is not real. It's completely made up." New York-based journalist Jane Eisner, former editor of The Forward, a Jewish newspaper, said many American Jews have "Netanyahu fatigue" — even some who supported him in past. Among liberal Jews, Eisner said, there are strong worries that Netanyahu will push Israel's government even further to the right if he wins, perhaps moving to annex some land in the occupied West Bank with confidence that the Trump administration will not object. "People would be nervous if he's not there," Klein said. Jack Rosen, president of the American Jewish Congress, said any surge in Netanyahu fatigue should not be interpreted as a weakening of American Jews' support for Israeli. Among liberal and centrist American Jews, dismay with Netanyahu extends beyond his alliance with Trump. Some say he's been too harsh in his treatment of migrants, and they bemoan his backtracking on a promise to allow mixed-gender prayer at the Western Wall. Perhaps most disturbing has been Netanyahu's alliance with an ultranationalist political party linked to a movement previously banned for anti-Arab racism and incitement. That political alliance was assailed as "repugnant" by Eric Yoffie, a rabbi from Westfield, New Jersey, in a March 27 op-ed in the Israeli newspaper Haaretz. Yoffie also decried Netanyahu's "excessive enthusiasm" for Trump. "Cordial relations are essential," wrote Yoffie, president emeritus of the Union for Reform Judaism. "But the sycophantic buddy movie that Bibi has produced with America's unbalanced and unpredictable president is something else altogether ... Bibi's egregious and unnecessary embrace of everything Trump will cost Israel dearly." In Israel, a prevalent view, at least in pro-Netanyahu ranks, is that the prime minister's friendship with Trump is paying unprecedented dividends. There is widespread sentiment that liberal American Jews, as a constituency, are dissipating due to intermarriage, and that the evangelical Christian community in the U.S. is a more dependable ally for Israel. At last year's ceremony in Jerusalem celebrating the relocation of the U.S. Embassy from Tel Aviv, evangelical Christian pastors allied with Trump delivered the opening and closing blessings. Netanyahu's main challenger in the election is Benny Gantz, a former military chief popular in Israel but with a relatively low profile in the United States. American Jews who dislike Netanyahu view Gantz as preferable, due in part to a less combative personality, but liberals note with frustration that the platform of Gantz's Blue and White party makes no mention of Palestinian statehood, and says that Israel will maintain control of parts of the West Bank. Emily Mayer of IfNotNow, a group of youthful American Jewish activists opposed to Israel's treatment of Palestinians, is dismayed at how that issue has been marginalized in the Israeli election campaign. "Regardless of the winner, the utter erasure of Palestinian humanity from this election cycle and the normalization of an undemocratic and immoral military occupation should alarm any Jew who cares about freedom and dignity of Israelis and Palestinians," Mayer said in an email.